Acecaceae includes approximately 2oo genera of evergreen solitary or clustering trees or stemless shrubs, rarely climbers, from tropcical and mild temperate regions. The architecture of palms is elegant and diverse. Though unfamiliar to many, inflorescencess and fruit are often highly ornamental. Leaves are compound, some with pinnate leaflets arranged along a midrib and sometimes with an elongated petiole base that sheathes the top of the trunk. Other palms have palmately compound leaves, with the leaflets spreading fanlike and radiating from a disklike structure at the end of the petiole. Costapalmate leaves are also fan – shaped but somewhat folded lengthwise, the sides arching, with the bases congested on a short rachis. Fishtail palms are the only bipinnately leafed palms, with a branched rachis and wedge – shaped leaflets. Palm leaflets may be partially fused along their edgess or completely free, juvenile leaflets are often more fused than adults. Flowers are small. in many – flowered panicles. The inflorescence is subtended by a spathelike bract. The apical meristem at the apex of the trunk or stalk is the only growing point. It cannot be cut bacck without killing the individual stem, making it very important to select palms of appropriate mature height. Palms are susceptible to a variety of diseases and pests. Lethal yellowing disease has devasstated sussceptible species where it occurs. Palms often develop nutritional deficiencies in alkaline soils and need supplemental micronutrients. Photos of the trunks and leaf scar patterns are provided here because they are often ornamental and excellent field marks that are easily observed at eye level. Palmswere photographed primarily at Faichild Tropical Garden and the Montgomery Botanical Center. Attalea includes approximately 30-71 species of solitary palms from tropical America. Some authors divide these species among Attalea (22 species), Orbignya (20 species), Scheelea (28 species) and Maximiliana (1 species) based upon minor differences of floral anatomy. They are combined here because they are very closely ralated and intermediate forms are recognized. Leaves are pinnate, relatively long, and shaggy, in 1 or 2 ranks. Old leaves are semipersistent, remaining attached to the stem for a long time. Male and female flowers are on the same plant. 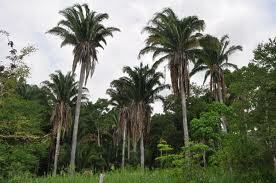 These palms are generally massive, slow growing trees of both dry and seasonally moist forest. They require plenty of space to spread. The oil is used for fuel by indigenous peoples and the seeds are eaten by wild and domestic animals slike. Synonyms; A. zonensis, Scheelea liebmanii, Scheelea phalerata. mexico. Solitary palm to 50 ft. +, zones 9-11. Blooms intermittently. Regular moisture and humidity. Fertile, well drained soil. Full sun. Flowers: unisexual. Leaves: ascending. Stems: stocky, leaf scar rings undulating, smooth. Synonym: Orbignya cohune. Central Amirica. Solitary palm, 40-50 ft. +, zones 9-11. Blooms intermittently. Regular moisture and humidity. Fertile, well drained soil. Full sun. Flowers: unisexual. Leaves: pinnate, to 25 ft. long even on relatively young trees, tips lax, bases long and broad, persistent for many years. Stems: thick, leaf scar rings undulating.